Born in Vancouver in 1943. When he was still in his teens, Tom Northcott was gaining a reputation while making his rounds through the Vancouver coffeehouse circuit in the early ’60s. In particular, he frequented the Kitsilano area, the focal point of the hippie counterculture north of San Francisco. 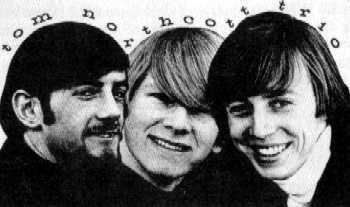 But by the end of the year Northcott left and, on 12-string guitar, he formed The Tom Northcott Trio with drummer Chris Dixon and Rick Enns on bass. They were soon regulars on CBC TV’s Let’s Go program for the next couple of years. Meanwhile they were selling out the top clubs in the area, such as The Afterthought in Kitsilano. They headed to California and played throughout San Fransisco and Los Angeles. This exposure got them further gigs and they opened for The Who, The Doors and Jefferson Airplane. In December 1965 they released “Just Don’t” to overall good reviews and it charted on both CKLG and CFUN. Their next single, “Going Down,” followed in the summer of 1966. “Going Down” is a song about a guy who’s telling his girlfriend that he knows she’s going downhill and heading for a fall. Well is there one more thing you want? One more thing that I can do? Have you done enough to me? Have I done enough to you? Looking at another goin’ down. I hope you land the hardest of them all. Whoa, oh, oh, hey, hey, hey, well, well, well. This crazy world spins upside down. on your circus ferris wheel. So dally and your road… last night. There’s a stupid mule in the daylight. you’re head high is so far off the ground. analyze what you’ve done wrong. they don’t know what’s going on. have brought you the trouble you would hide. you better go and start again. Hey, hey, hey, aw, aw, oh, well, well, well. “Going Down” is a song that offers advice to someone whose gotten out of touch with themselves and has an exaggerated sense of self-importance. The lyrics describe an impasse in a deteriorating relationship: “have you done enough to me/have I done enough to you.” There is a sense that one person in the relationship is going to get knocked down a peg or two given their attitude: “look out girl I know you’re gonna fall/I hope you land the hardest of them all.” The viewpoint the guy sees is of a partner he is breaking up with who has been ungrounded. He concludes: “when you finally come to earth/analyze what you’ve done wrong/get rid of your useless friends/they don’t know what’s going on.” The only way forward is to start from scratch and head down a new road, grounded in reality and a healthy dose of humility. This will involve not expecting others to be painted clowns and treat life like it’s one big circus. The distractions of ferris wheels and other rides have, metaphorically, been part of the problem. 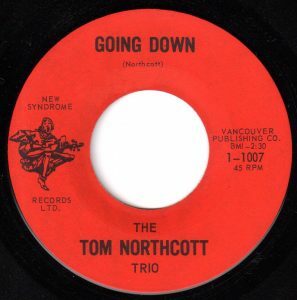 The garage band sound the Tom Northcott Trio achieved with both “Just Don’t” and “Goin Down” caught on locally in Vancouver. “Going Down” got some airplay on Edmonton’s CJCA and peaked at #49 on the Canadian RPM chart, but mostly due to its chart performance in Vancouver. It didn’t chart in the USA. Next up for Tom Northcott, he formed a band called The Eternal Triangle. In September 1966, they had a minor hit in Vancouver titled “It’s True. Northcott was also one of a roster of regular performers to appear on the Vancouver based CBC TV show Let’s Go. Other performers to appear on the Vancouver show were Gillian Russell, Howie Vickers, Mike Campbell and Susan Pesklevits (later Susan Jacks). CBC ran the show each weekday from 5:30 p.m. to 6 p.m. The Vancouver show was aired on Mondays hosted by Fred Latremouille and Red Robinson. Winnipeg’s Let’s Go TV show was on Tuesdays, Toronto on Wednesday, Montreal on Thursday and Halifax on Friday afternoon. Mark Allan, Ron Grahame, Susan Jacks, Dennis McFadden, Fred Robinson, Tom Northcott, Canadianbands.com. Dennis MacFadden, Vancouver Playboys ~ Pacific Northwest Bands, October 2008.